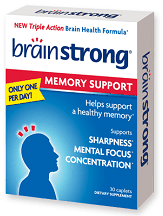 The following review is for Brainstrong Memory Support Supplement. This supplement is designed to improve the three key areas of the brain, memory, focus, and mental sharpness. It also claims to give support to the brain’s communication network, and to improve blood flow and circulation. The instructions for this supplement is very simple. Take one capsule per day with any meal. There were no instructions on the website regarding if children under 18 or pregnant women can be able to use this product. This supplement can be purchased online at brainstrongmemory.com. It is $15.99 for 30 capsules, which is enough for one month. There doesn’t seem to be any discounts for multiple purchases for a longer period of time. Consumers also can purchase the supplement at a local Walgreens or Rite Aid. One can receive a $3 coupon by signing up for their mailing list at the aforementioned website. After taking these supplements daily for a couple weeks, I have noticed a small improvement in my memory. So far I haven’t had any huge differences, but I have found it easier to focus on my work. I believe that this product will produce long term improvements if I keep taking it, but my hopes are not that high. There are many different possible side effects to these capsules. BrainStrong should not be taken by people who have recently had surgery or are recovering from severe wounds, because of possible blood thinning. These pills can also raise blood sugar levels, which would be problematic for people with diabetes. Some consumers have also experienced digestive issues like nausea and upset stomach. Notify a doctor if any symptoms occur that are out of the norm or extreme pain begins. There is no commitment stated on the website specifically, but it is very likely that the company has their own policy regarding returns or refunds. It would be best to contact the company before purchase to make sure. There are also no reviews of the product at all on the website, leading to thoughts as to whether this product is effective or not. If you are looking for a drug-free memory supplement to help with memory and improve blood flow, then this supplement may be for you. It’s priced relatively cheaply for a month’s supply, especially with the $3 off coupon for signing up for the mailing list. But the lack of manufacturer’s guarantee is concerning, and is a waste of a consumer’s time as they need to specifically contact the company. The lack of reviews is also troubling.